Around here, February is Old Toys Month, and this month we're doing four guaranteed weeks of MotU Monday. But so you Marvel fans don't feel left out, we'll do some Marvel Monday quickies here on the blog. The Norse god of thunder crushes evil with his hammer! The reason we feel fine dropping this review on the blog instead of doing a full review is that this figure is mostly just a repaint of the Series 1 Thor, and thus also of the SDCC exclusive Thor we already reviewed. For all the shared details, we invite you to read that review - this one will focus on the changes. For instance, the paint: this figure is meant to represent the "Marvel NOW!" costume, so it's been painted in black and a dark blue, and the armor on his legs is only painted silver on the outsides. It's not a perfect rendition of the costume, but it tended to vary from book to book, so who's to say this isn't right? He'll look fine with Marvel NOW! Captain America. The head is one of the new pieces. His face is more detailed, because it's based on a different artist's work. The helmet has a definite martial feel, as well: the last one was small and smooth and had feathery wings; this one is larger and more ornate, with armor over the cheeks and metal wings as decoration. 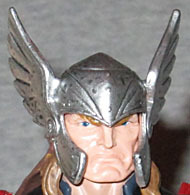 A brown leather drape hangs from the back of the helmet, covering Thor's neck (though here it's just sculpted along with his hair). Another new element are the arms. The Marvel NOW! design kept vacillating between bare arms and sleeves, and this one goes for the former. He's wearing... not gloves, exactly, but studded leather wristbands and then handwraps that slip over his thumbs to keep them in place. 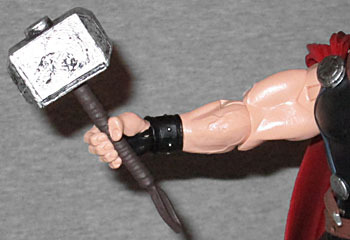 His Mjolnir is the same sculpt as before, and can be hung from his belt the same way. For the first time, this Thor mold comes with a BAF piece - two, in fact. He's making up for lost time! The first piece is the right leg of The Allfather (not specifically Odin, as we'll discuss when we get to the BAF review), and the second piece is a sword. Now, the earliest promo art for Marvel NOW! showed Thor with two swords straped to his back, but that never came to pass, so we have to assume the weapon isn't for Thor (though who's going to stop you if you want to give it to him?). Thor isn't the most thrilling figure in Series 6, but he looks distinctly different from the previous releases and comes with BAF pieces, so he's worth some attention. 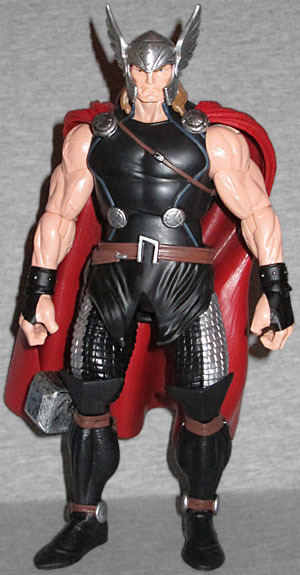 This entry was posted in blog exclusive review, Hasbro, Marvel and tagged Marvel Legends, Thor. Bookmark the permalink. The image on the back of the box shows Thor holding it. So, I think it is for Thor.